Montreal, August 31, 2017 - Just back from China earlier this week where he competed in Round 3 of the FRD LMP3 Prototype Series, Alex Tagliani will be a very busy driver this weekend as he is registered in the two major NASCAR races at Canadian Tire Motorsport Park road course (formerly known as Mosport Park), located north of Bowmanville, Ontario. In addition to his regular drive in the NASCAR Pinty's Series with the number 18 EpiPen-Lowe's-St Hubert-Spectra Premium racecar, Tagliani will make a comeback after a one-year absence and drive in the NASCAR Camping World Truck Series for Young's Motorsports from Mooresville, North Carolina. 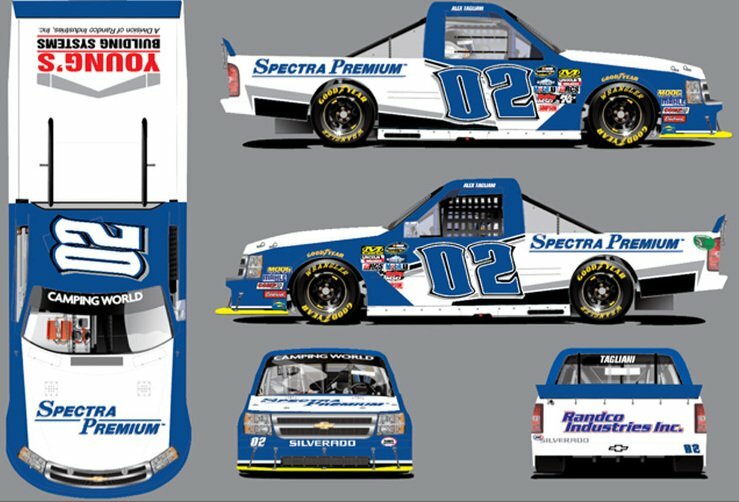 Tagliani will pilot the Canadian sponsored no 02 Spectra Premium Chevrolet Silverado. In 2014 and 2015, the Quebec driver won back-to-back poles in the truck series. Two years ago, on the heels of the race leader and with only half a lap to go, Tagliani saw his hope of a win disappear when he could not shift into third gear. He finished the race fifth. This will be Tagliani's 11th career start in a NASCAR national series. In his first 10 races in the Truck and XFinity Series, he won six poles, finished second three times and collected five top-five and six top-10 results. This will be Tagliani's third start in the truck series. Last year in the Canadian NASCAR Pinty's Series, he set a new series qualifying record to win the pole, but was plagued with power steering problems early in the race costing him once again the chance of collecting a first win at this historic track. This will be Tagliani's fifth Pinty's series start at Mosport. In his four previous starts, the driver from Lachenaie, Quebec collected one pole, and a best finish of fifth place. Overall, Tagliani has six wins, eight poles, 21 top-fives and 35 top-ten finishes in 55 NASCAR Pinty's Series starts. "With all this stuff going on, getting ready for my two NASCAR races this weekend at Canadian Tire Motorsport Park has not been easy. I did not have a lot of time to spare since my return from Shanghai where I raced in the FRD LMP3 doubleheader," Tagliani said. "Of course, I must concentrate on the NASCAR Pinty's Series race driving my number 18 EpiPen-Lowe's-St Hubert-Spectra Premium Dodge, as well as race in the NASCAR Truck Series headline event. It will be a very busy weekend with the addition of the second race in the number 02 Chevrolet Silverado truck sponsored by Spectra Premium. I am always a proud representative of all my sponsors, and I do have to thank Spectra Premium, which is sponsoring me in my return this weekend to the NASCAR Camping World race. It is always an honour to defend their colours on track, especially here on this historic road course. I am looking forward to performing well and making them proud." In the Pinty's Series, Tagliani will be on track Saturday driving the number 18 EpiPen-Lowe's-St Hubert-Spectra Premium Dodge for the 55-minute practice session scheduled to stat at 1:05 p.m. The first qualifying wave will hit the track at 4:40 p.m. and the second, with Tagliani, at 5:05 p.m. The green flag for Sunday morning's Total Quartz 200, a 51-lap race, will be waved at 11:05 a.m. Twenty-four drivers are entered in Round 11 of 13 of the 2017 schedule. The Total Quartz 200 will be aired Saturday, September 9 at 2:30 p.m. on TSN. In the NASCAR Camping World Truck Series, the Quebec driver will be on track twice on Saturday during open practices to get familiar with his Chevrolet Silverado Spectra Premium before qualifying. The first 55-minute practice will be held at 9:30 a.m. and the second, an 80-minutes session, will start at 11:35 a.m. Qualifying on Saturday will be televised live on the FOX Sports Racing Network (for those lucky enough to get from your cable provider - channel 792 with Videotron in Quebec) starting at 5:30 p.m. The Sunday 64-lap Chevrolet Silverado will start Sunday at 2:30 p.m. Live coverage of Round 15 of 23 on FOX Sports will start at 2:00 p.m. All times are local (Eastern) Thirty-two drivers are entered. In the NASCAR Pinty's driver standings with three races to go, Tagliani is still sixth overall with 363 points, but after the last race, he has closed the gap to 15 points on fifth place held by LP Dumoulin. Following his win in Nova Scotia two weeks ago, Alex Labbé, with 432 markers, has extended his point lead over Kevin Lacroix to 36. Lacroix was penalized 10 championship points after he made contact with Labbé on the cool-down lap. His lead over third place held by series defending champion Cayden Lapcevich, is now down to eight. D.J. Kennington is fourth, only 10 points back form the St. Eustache driver. Everyone can join the food allergy conversation in the Drive the Discussion Contest by posting his favourite food allergy tip on how to safely manage food allergies that can be shared with others. Each post qualifies them for a chance to win one of five weekly prizes and/or a grand prize from Lowe's/RONA. Don't forget to share your tip with a friend - if they comment on your tip, then they will be eligible to win: go to foodallergycanada.ca /tag. You can also follow Tag on Facebook and Twitter @Tagliani or on his website at www.TaglianiAutosport.com.